Heat closed contact grill 5 minutes. Spread butter on one side of each bread slice. On unbuttered side of 1 bread slice, spread 1 tablespoon of the dressing. 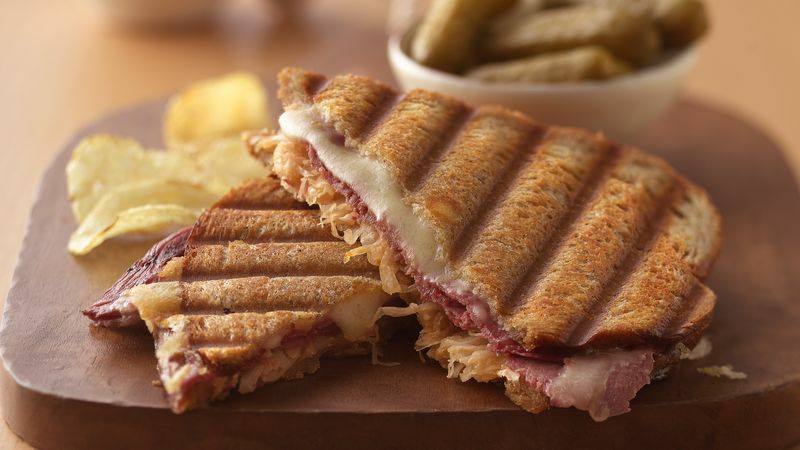 Top with 1/4 cup of the sauerkraut, 2 oz corned beef, 2 slices cheese and remaining bread slice, buttered side up. Repeat for remaining sandwiches. When grill is heated, place sandwiches on grill. Close grill; grill 5 to 6 minutes or until cheese is melted and grill marks appear. Serve immediately. If you don't have a panini grill, you can “grill” these in a skillet over medium heat, approximately 3 to 4 minutes per side.